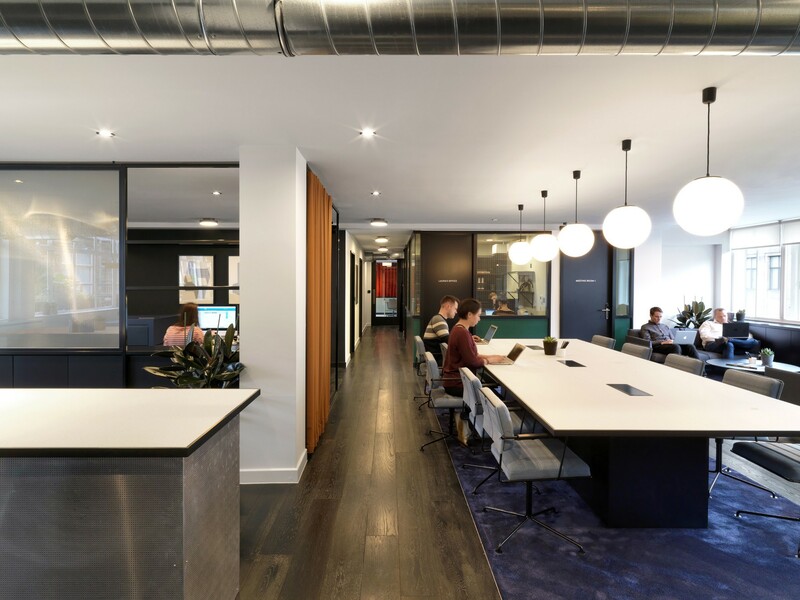 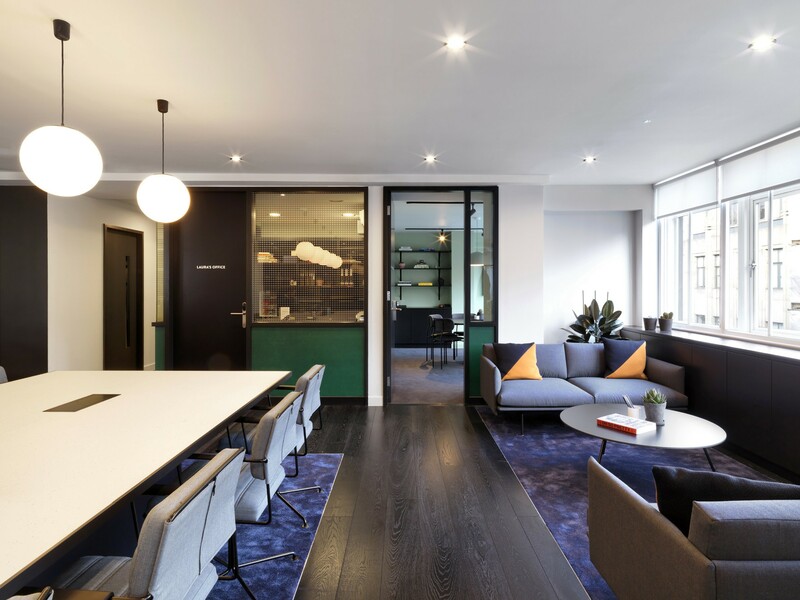 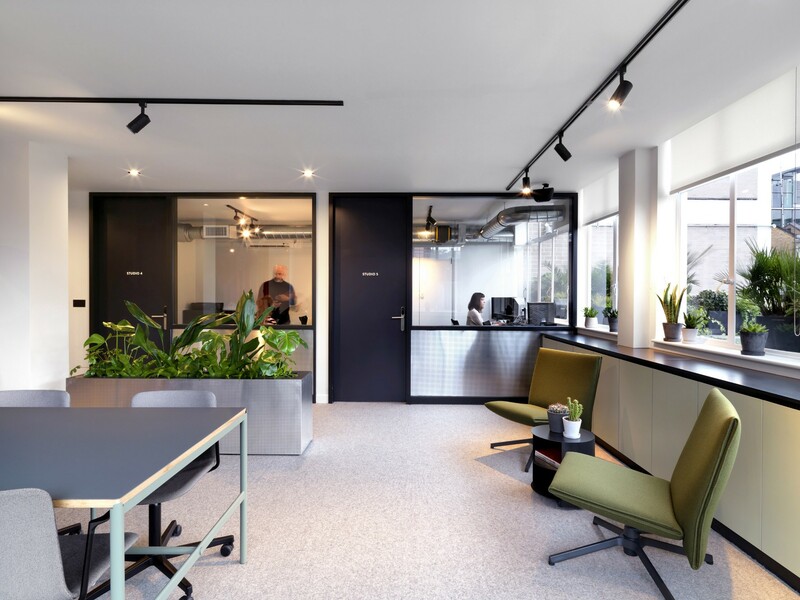 Universal Design Studio has designed The Office Group’s first building in London’s Soho which opened in February 2018, offering 1,750 sqm of serviced office and co-working space. 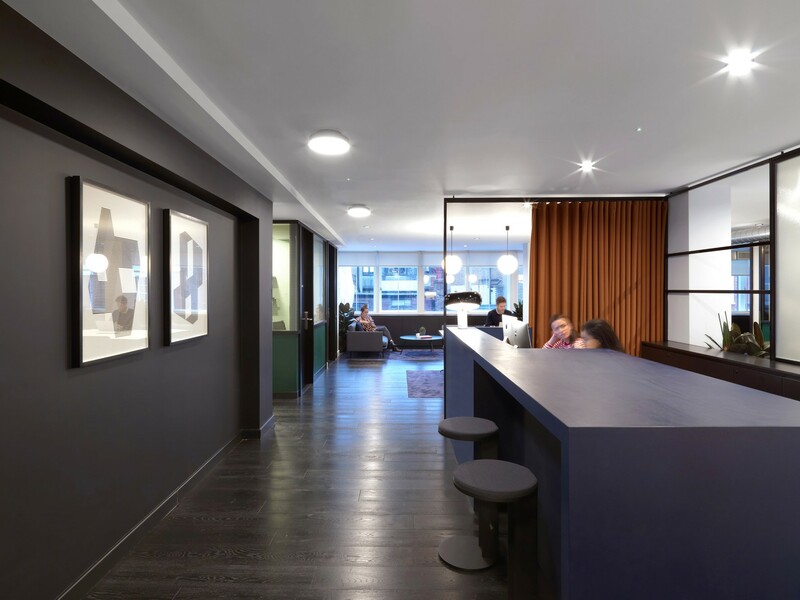 In developing the design approach for 151 Wardour Street, the team researched iconic Soho spaces including bars and cafés from the mid century era. 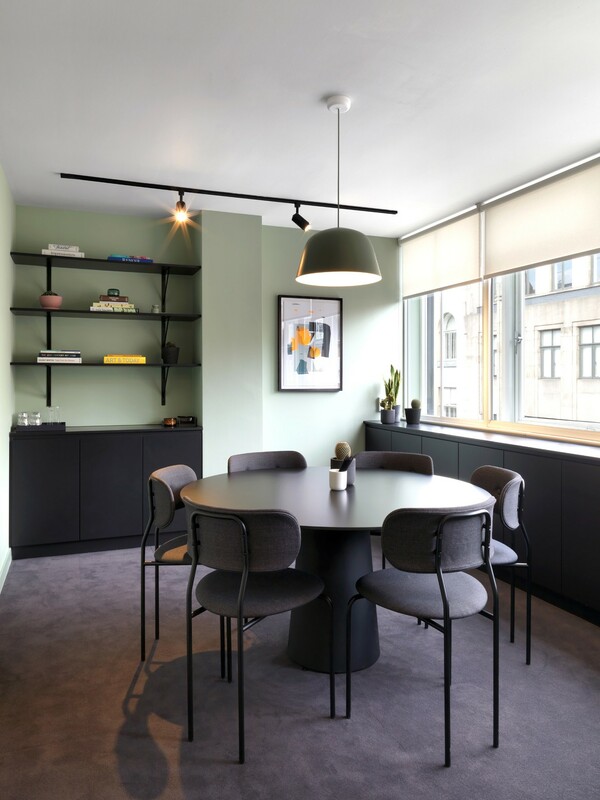 These spaces incorporated materials like polished chrome, formica, aluminium and plastics with influences from continental Europe and the USA such as pop art colour combinations. 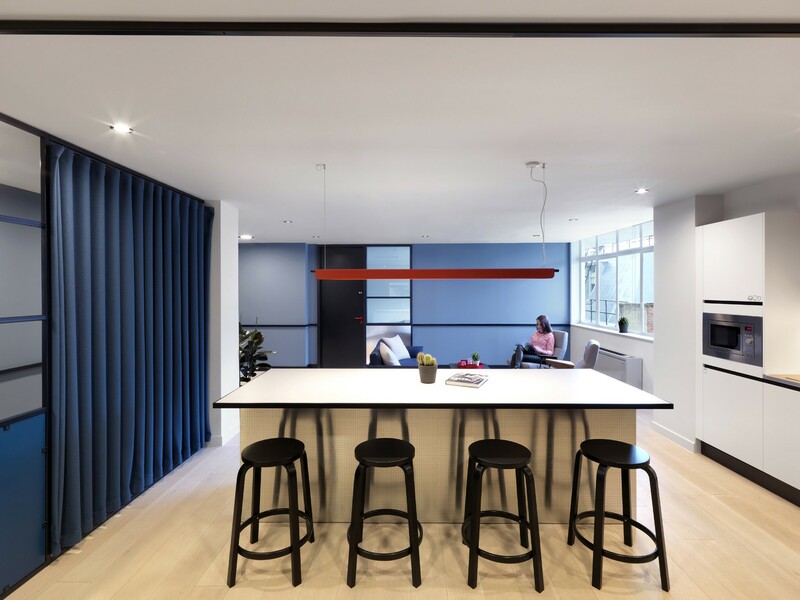 The palette of materials includes indigo denim upholstery and curtains, recycled plastic, linoleum and perforated aluminium, that are set against a backdrop of block colours and framed screens. 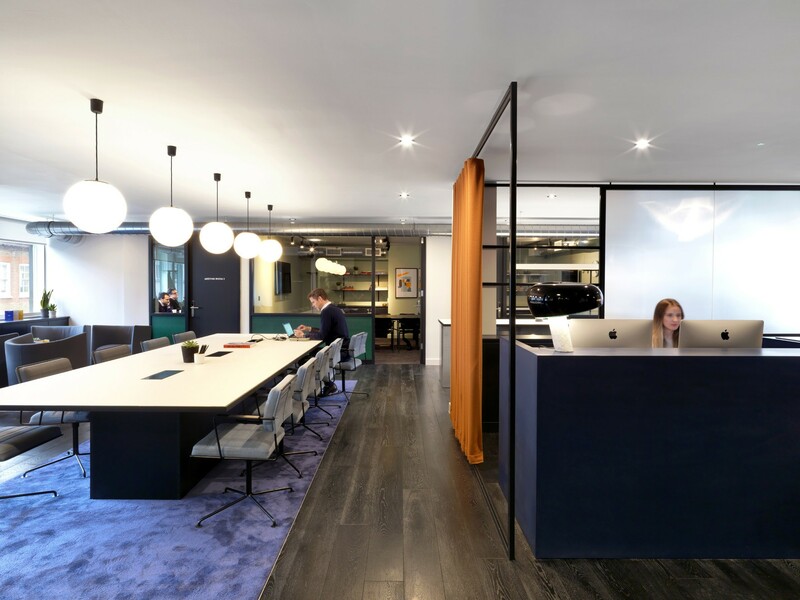 This approach has resulted in graphically striking spaces. 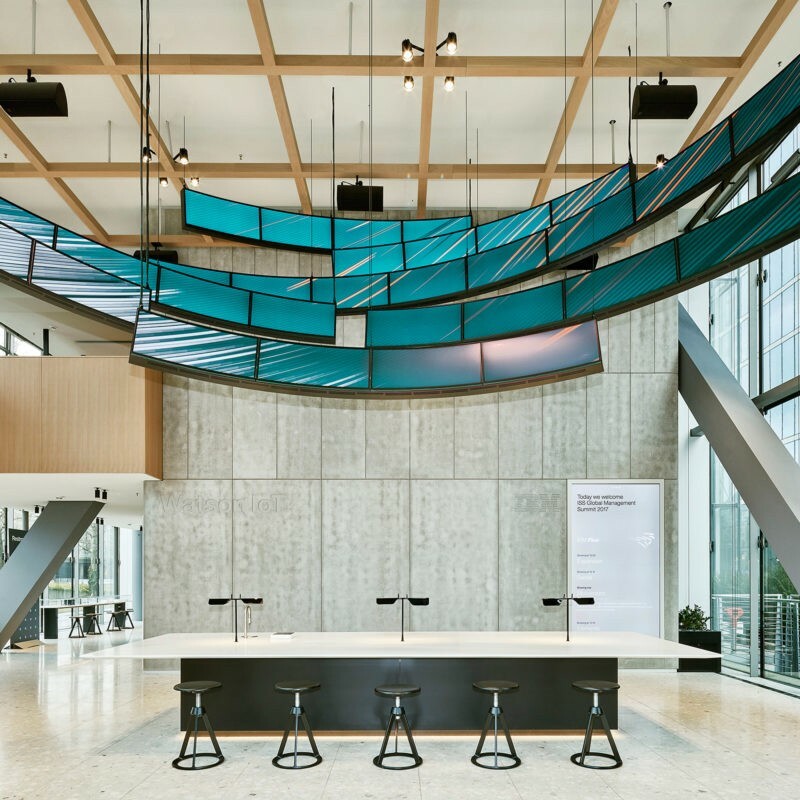 The Ground floor entrance doors and screens incorporate the graphic framework used throughout the project as a connecting motif. 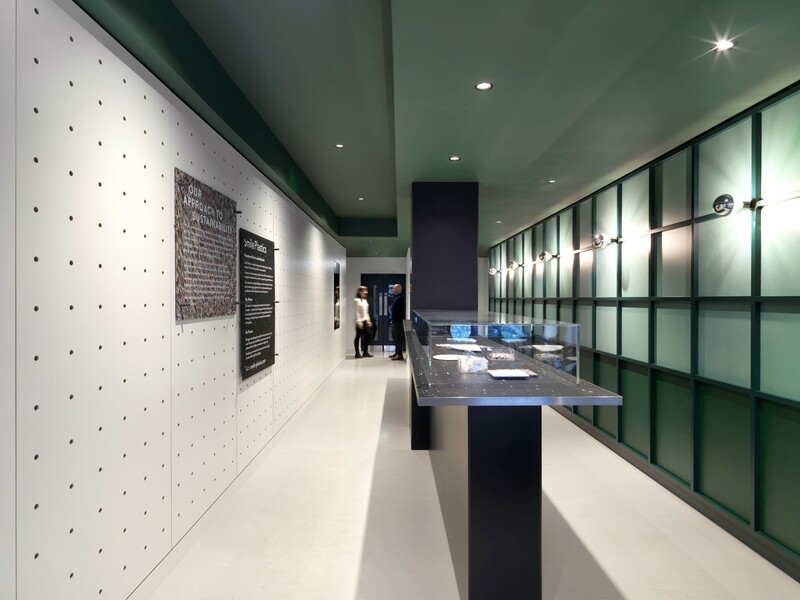 A display counter and flexible exhibition wall run the length of the entrance space, providing members with a unique space to showcase their work. 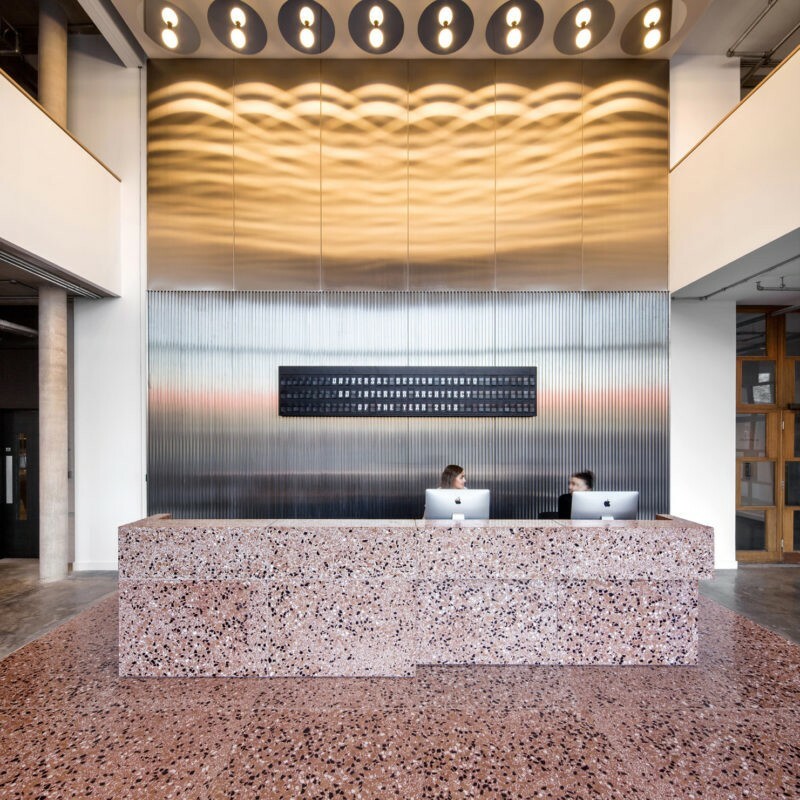 The heart of the building on the third floor accommodates the main reception, co-working spaces, studios, a lounge area and meeting rooms. 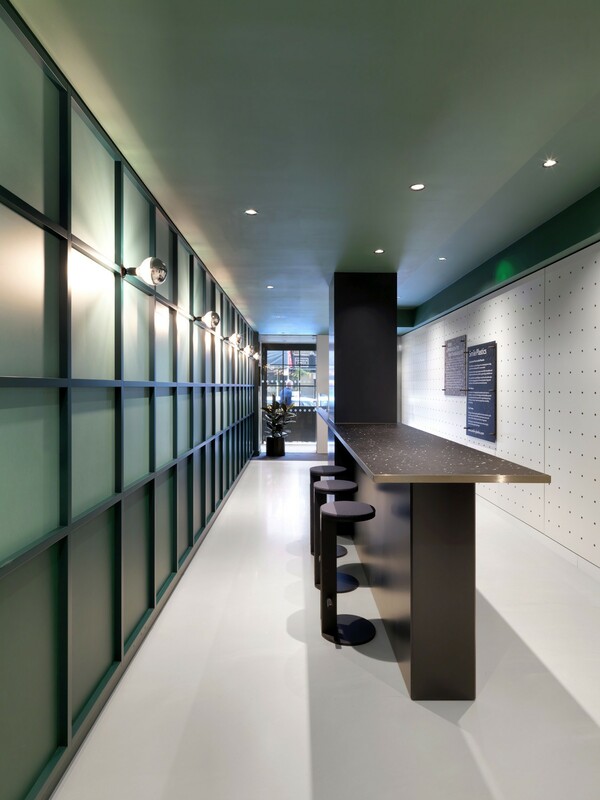 This floor has been subdivided into a series of rooms, reminiscent of the classic bars and clubs of Soho with the use of curtains and screens to create pockets of space to meet in or escape to a hidden corner for a quiet moment. 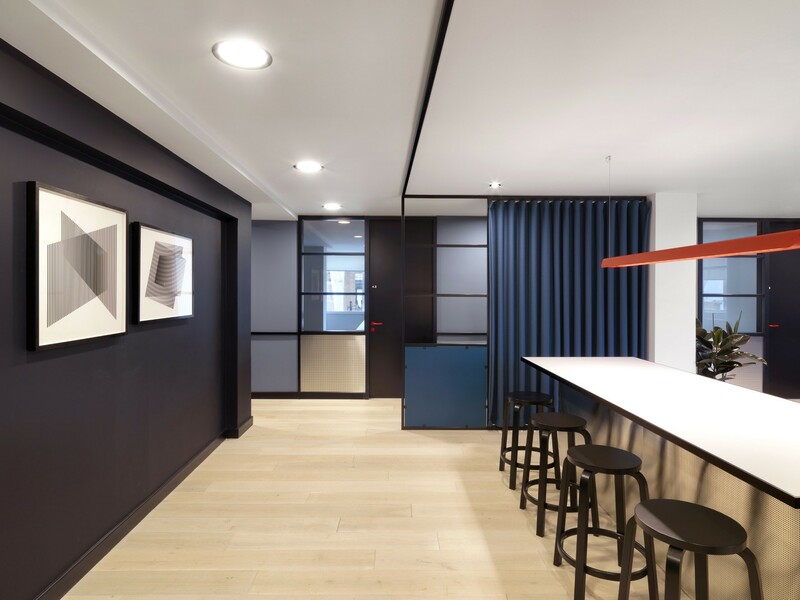 The remaining floors accommodate serviced offices and hubs and continue the graphic framework screens and details found elsewhere.